2. 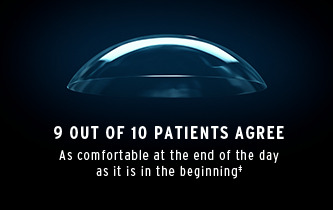 Results of an online survey with patients that wore their lenses for 7+ days and on average, wore their lenses for 8 or more hours a day (n=485). Survey questions were top 3-box scores (% Strongly Agree, Agree, Slightly Agree) on a 6-point agreement scale, with a margin of error +/- 2.4%. 3. Subjects that spend at least 3 hours each workday using a computer or electronic device and experienced dry eyes were assessed in these 2 weeks, single arm, bilateral, open-label study. 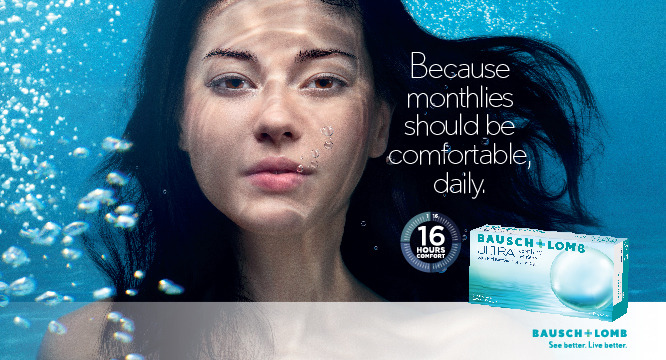 Habitual wearers of Acuvue Oasys, Air Optix Aqua, Biofinity were enrolled by 22 independent investigators. Following 7 days of wear, subjects completed an internet survey to capture their perspectives regarding the product. Investigators completed slit lamp examinations and exited the subjects, after 2 weeks of product use.